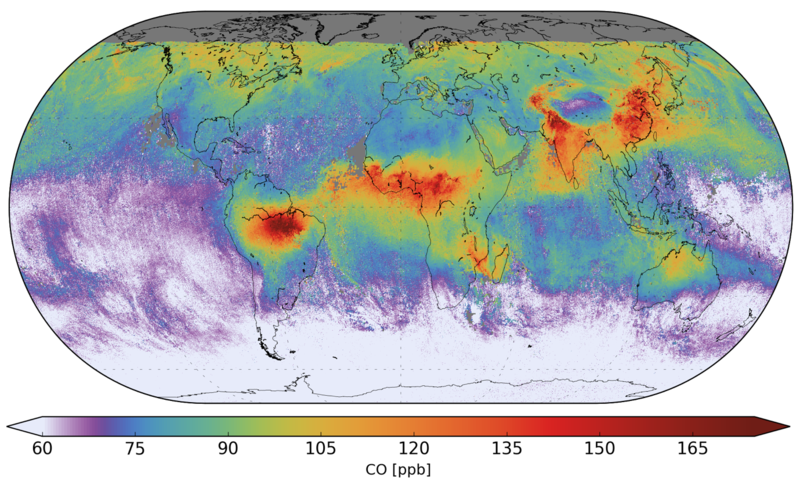 Carbon monoxide (CO) is an important atmospheric trace gas for our understanding of tropospheric chemistry. In certain urban areas, it is a major atmospheric pollutant. Main sources of CO are combustion of fossil fuels, biomass burning, and atmospheric oxidation of methane and other hydrocarbons. Whereas fossil fuel combustion is the main source of CO at Northern mid-latitudes, the oxidation of isoprene and biomass burning play an important role in the tropics. TROPOMI on the Sentinel 5 Precursor (S5P) satellite observes the CO global abundance exploiting clear-sky and cloudy-sky Earth radiance measurements in the 2.3 µm spectral range of the shortwave infrared (SWIR) part of the solar spectrum. TROPOMI clear sky observations provide CO total columns with sensitivity to the tropospheric boundary layer. For cloudy atmospheres, the column sensitivity changes according to the light path. The figure below shows the S5P/TROPOMI CO total column mixing ratio averaged from November 13th to 19th, 2017 (from Borsdorff et al., GRL 2018). The data show clearly CO enhancements by wildfires in Brazil, Africa, Madagascar, and Australia as well as anthropogenic air pollution in India and China. Data product version summary (click on highlighted version number for the latest PRF). Links to the Algorithm Theoretical Basis Document (ATBD), Product User Manual (PUM), and the Product Readme File (PRF) is provided here on the right under Documentation. Note: the OFFL version of this data product was publically released on 11 July 2018, the NRTI product was released in Nov 2018, and both are available via the Copernicus Open Data Access Hub (see link on right).